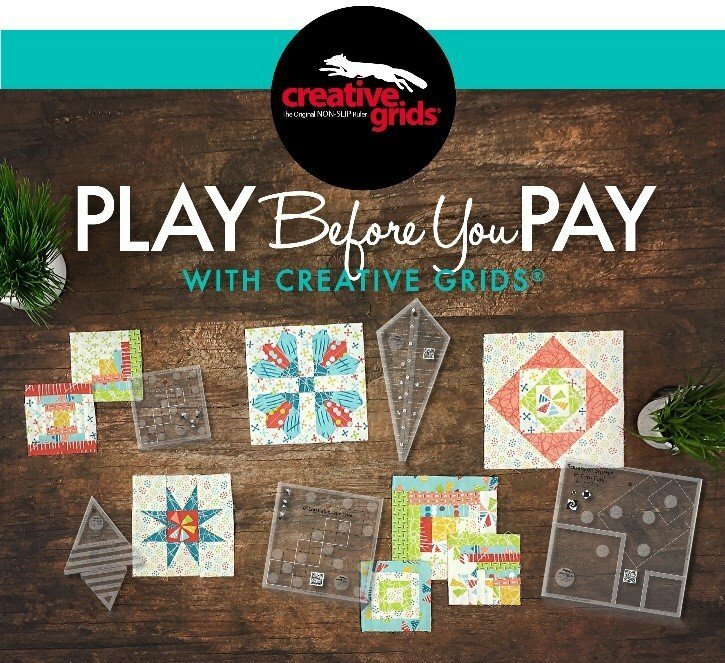 Join us for an action-packed “Play before you Pay Creative Grids® event. All rulers and fabrics are provided so you can make four to five different blocks – and learn additional techniques – in a fun and easy class. Create blocks that include fudge factors so beginners to experts can sew them in a matter of minutes. Make perfect “Log Cabin” blocks by trimming each round as you go. Learn how to sew star blocks with floating points – and never cut a triangle. Create “Square on Square” blocks in two sizes from one tool. And, finally, sew a twelve-petal Dresden Plate block and learn how to “separate” it to create even more design possibilities. Once you know how to use the tools, these techniques can be combined to make this queen-sized Medallion Quilt. The pattern is only available to shops who host a Creative Grids® event – and is your gift for attending the workshop! Note: This quilt also uses the four-inch log cabin – #CGRJAWMN4 and the Round-Up Tool – #CGRATK1.